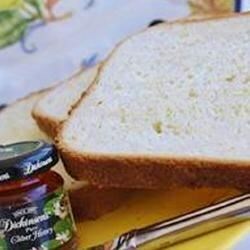 "This white bread with excellent flavor and texture. It toasts and stores well. Everyone loves it!" Place ingredients into the pan of the bread machine in the order suggested by the manufacturer. Select the Basic/White Bread setting, and Start. the bread flavor is great ,the top fell in. and i was disappointed with that. I subbed 1 cup whole wheat flour for the white flour, and used 1 T. molasses for 1 T of the honey. Then, I shaped this into 13 hamburger buns, and baked at 375 for 20 minutes. Delicious! Love this recipe! The bread is soft and moist and airy. I also have made cinnamon rolls out of this recipe with excellent results.